Rob-See-Co represents a commitment to innovation, relationships and knowledge. With roots that date back 125 in the seed industry, Rob-See-Co is innovative in both the technology it uses in the field and online. 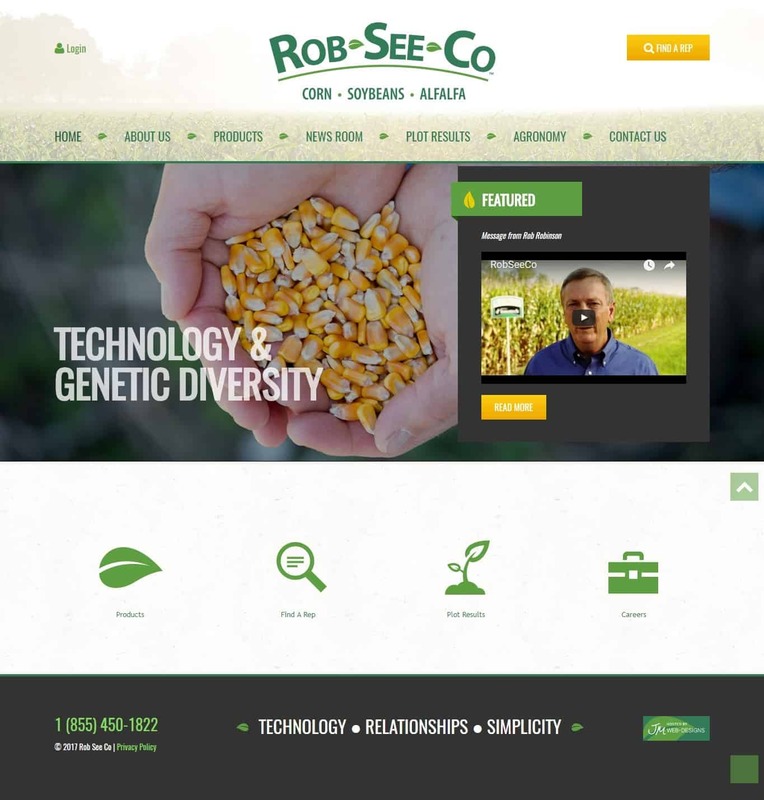 With a growing need to serve their customers online in a more robust way, Rob-See-Co partnered with our Omaha web design and development firm to create a more interactive website. While this website is a customized pre-built WordPress content management system, the layouts are customized to fit Rob-See-Co’s needs. The team page is a customized layout, meant for easy contact. And its Find a Rep tool includes an interactive map, making it easy for users to make local connections for better service and relationships. The new website is also equipped with a secure portion that allows users access to an intranet system to view files and other industry-related information based on their user role. Rob-See-Co’s new website provides a level of professionalism and is partnered with a user-friendly CMS. Meeting both the needs of customers and employee management, our Omaha web design team is pleased with the final product, and wishes Rob-See-Co great success as the website and company grow. Zephyr Catering Omaha is committed to exceptional quality. From planning to prep to food to clean-up, Zephry Catering is focused on the details. A polished and professional website is no exception to its detail-oriented commitment. In partnership with our Omaha web design team, Zephyr Catering recently launched a new website featuring its food, services and chef. 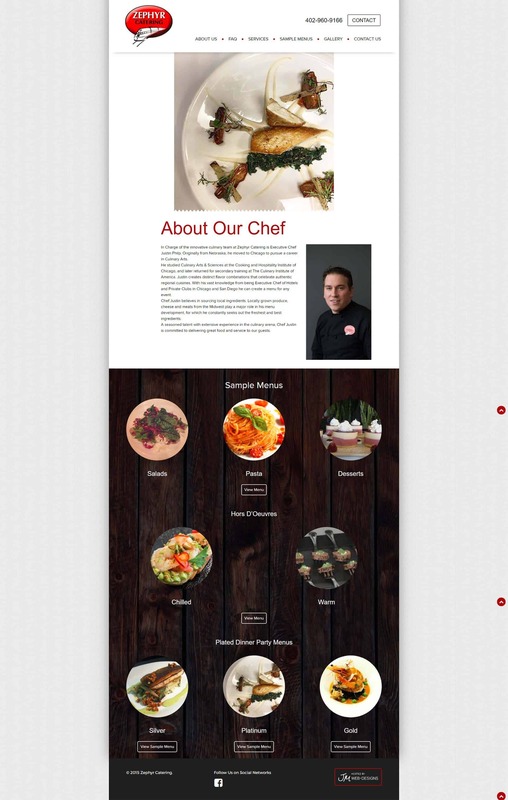 This new website is a pre-built WordPress template customized to fit Zephyr Catering’s brand and needs. The WordPress content management system allows for easy content and image updates, particularly important with changing and growing menu options. It’ also mobile-friendly, as it uses responsive technology. Building a website that reflects Zephyr’s excellence and commitment was a pleasure. We wish them great success with the new website and know it will serve them well for many years to come. A. Cavallo Violins in Omaha, NE, crafts and sells stringed instruments and accessories to beginner and seasoned artists. While the brick and mortar store is in Omaha, its products and services are sought after by artists around the country. For a wider reach, A. Cavallo Violins partnered with our Omaha web design team to design and build a new website that offers ecommerce functionality while displaying beauty and professionalism in the design. This ecommerce website is built on a WordPress content management system platform and utilizes a WooCommerce shopping cart system. It showcases products for purchase, as well as sought-after instruments they’ve previously held in inventory – both easy to manage in the CMS. We’re excited to provide such a beautiful product to A. Cavallo Violins and know this new website will help broaden its reach outside of Omaha. Omaha has graciously voted JM one of the best web developers in the area, and we are so grateful! B2B Omaha magazine’s coveted Best of B2B Winners list for 2017 was released at the beginning of March, listing JM as second place for Omaha’s web developer category. The is truly an honor, as Omaha’s business owners must take time to fill out and send in a ballot. Celebrating over 10 years, this Best of B2B list help build credibility and prestige among Omaha’s business community. Our Omaha web design, internet marketing and development team is constantly striving to serve and advise our customers with honesty and integrity, and we’re thankful to be recognized in this way. Our successful Omaha web design firm is 19 years-old; but its accomplishments didn’t come without struggle and perseverance. JM’s Owner and Founder, Jonathan Patton, was recently interviewed by 4-Leaf Owners – a website which features successful business owners, sharing their successes and hardships. Jonathan’s article highlights some of these more trying times as an owner, but also the lessons he’s learned along the way. 4-Leaf Owners is dedicated to interviewing entrepreneurs who owned businesses but weren’t controlled by them. Click here to read Jonathan’s story about building one of Omaha’s most successful web design companies, and gain insight from his vantage-point. Calvin L Hinz Architects is a firm which provides architectural services nation-wide to a vast array of industries. Priding themselves on professionalism, beautiful design and thorough work, its previous website did not accurately represent those trademarks, and the team decided to redesign with JM’s Omaha web design team. 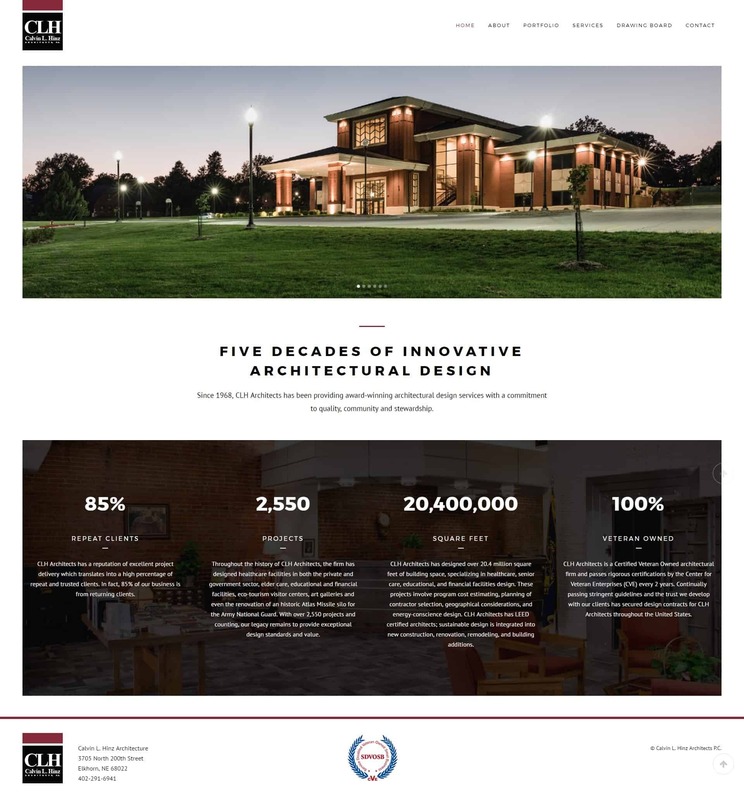 CLH’s new website has a most impressive portfolio, featuring their completed projects. This portfolio, and the entire site, utilizes a WordPress content management system. This CMS provides CLH with ease in updating the website. This pre-built responsive WordPress theme was also updated with several custom layouts – including the team, portfolio and home pages – to help showcase their talent and projects more effectively. This new website is functional and beautiful, and we’re thankful that CLH trusted our Omaha web design team to redesign and rebrand them for a more professional and clean look. Earthworks Health harvests and sells the purest freshwater food grade diatomaceous earth available on the market. Because of Earthworks’ great success they partnered with our Omaha web design company to rebuild their ecommerce website to serve its customers with updated design, better functionality and easy checkout. Earthworks Health’s website is built on a WordPress platform and uses a WooCommerce shopping cart system. WooCommerce allows for flexibility from both a developer and user standpoint – giving freedom for Earthworks to truly customize their shipping, checkout and product settings to fit its needs. Our Omaha web design team is grateful to work with such a successful nationwide company, and thankful that they trust us with their continued livelihood and online success. We look forward to a continued partnership as our Omaha internet marketing team begins to work on campaigns for even more customers and conversions!